My day shift at the hostel in Ipanema had ended and, as usual, I stuck around chatting with the friendly manager and some of the guests. Upon noticing it was already dark out, I said goodbye, then ran a quick errand before heading to the nearest Zona Sul supermarket, kiddie corner to General Osório square, to pick up some spaghetti for later. With the errands completed, I went a few blocks towards the beach to catch a public transport van back to Rocinha. Numbered according to their trajectory, I was hoping to catch the less frequent of the two lines that went through Gávea because it would leave me closer to my apartment. 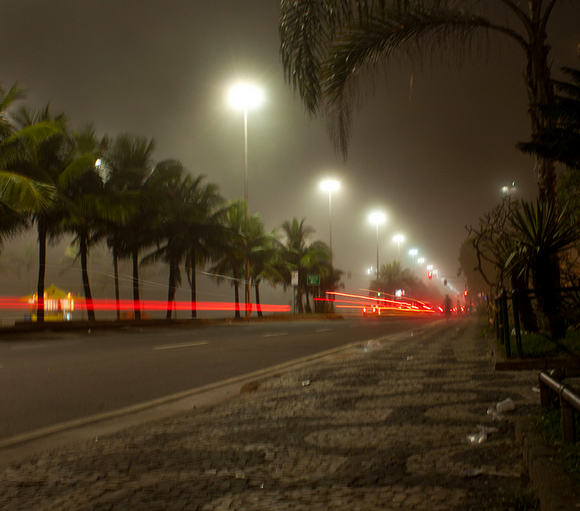 I waited there like on any of the other hundreds of times I had caught a van back home, aware of my surroundings, even though this was Ipanema and I was dressed in the usual shirt, shorts and flip-flops. As I held my grocery bag with its one item inside, I thought about the dinner I’d soon share with friends, accompanied by a beer from the bar across from my front door. Right then a lone young man (reminiscent of those I saw daily in the favelas) appeared on the median strip, shouting out to someone on the sidewalk where I was. Rio wasn’t a stranger to me and I had always kept my wits about me while living there. Even though I had never found myself in any kind of unwanted situation before, this guy didn’t immediately make me think twice, but he made me want to think twice. “Calma, just be cool”, I thought to myself, “I’ve got nothing visible he can steal,” knowing full well that prior to the supermarket, I had made a stop at the bank to take out R$60 for the next week. Luckily, while still in the bank, I had folded the bills up and stuck them, along with my bank card, under the waistband of my underwear. He shouted again, across the sparse lanes of traffic, which prompted me to take a quick look around me to see whose attention he was trying to get. It was mine. I was alone and it was dark. That’s when he went for my bag, with his eyes. “Tem comida aí? Me dá alguma coisa,” he suddely mumurred. “É macarrão, tem que ser cozido,” I reluctantly responded. I didn’t want him to think I was an easy target, and by that I mean gringo. I considered playing the sympathy card, telling him I was a resident of the morro, the comunidade (favela), without specifying which, but that might lead to more talking, and more talking might reveal I’m a foreigner. Two or three more times he asked for food but as many times as he asked, I denied him. That’s when he changed tatics. “Ô, me dá um real!“, he repeated, a little more directly. I realized this was going to continue for a while unless I either gave him money or food, which meant getting close to him physically, or I would have to go back to General Osório and walk down ‘Visconde’ (a main street in Ipanema) all the way to Leblon where I could also catch the same van. Just as I was about to offer up R$1 to get it over with, I heard another person shouting at me. It was the cobrador (fare collector) of the van I had been waiting for. Giving him a quick wave to stop the van, it blocked out the view of the lone peddler and I got on and went home. To this day, I don’t know what would have happened if I let him approach me. At the most, I suppose I could have lost a simple bag of spaghetti or maybe the bus fare. In the least, I would have helped someone in need. He was the one breathing thing that could have stood in the way of my belief that, crime-wise, Brazil isn’t as bad as others say it is.